Marketers today usually have to choose between developing a native app or a responsive website for their mobile marketing strategy. You don't need to rush and build a mobile app just because every one seems to be doing it. Mobile apps in general, allow for more creativity, and better interaction with your target audience. Once you know, how your target audience or your customers use mobile to interact with your brand or any brand, you can decide whether you need a mobile-ready website, an app, or both. So start with point one: Insight. In any form of digital marketing, consumer or customer insight is your first and most important step. If you find that the best way is a mobile app – make sure you create one that's going to be useful and relevant to your target audience. Will your mobile app provide a solution to their need? Will it resolve the reason they want to use your app (if that's the need)? Will it address their intent? Intent is the new black in digital marketing. In-the-moment marketing is what's hot. The Google Play store alone has over 1.6 million apps. The Apple Aps Store offers around 1.5 million. Apps seem to be very hot with brands and marketers now. Is your app going to stand out in that crowd? More importantly, will it be used? And will it stand the test of time? Creating a cool app from your brand point of view may be important for you. But if it does not provide an useful and relevant solution for users – you're wasting time, effort and money. Even if your app is slick and well-designed and gets a big number of downloads when you launch and 'market' it, it could be of no use to the audience down the line. Users will have abandoned it. The mobile app is part of your overall strategy. You'll need to make sure that you know about the essential elements first. 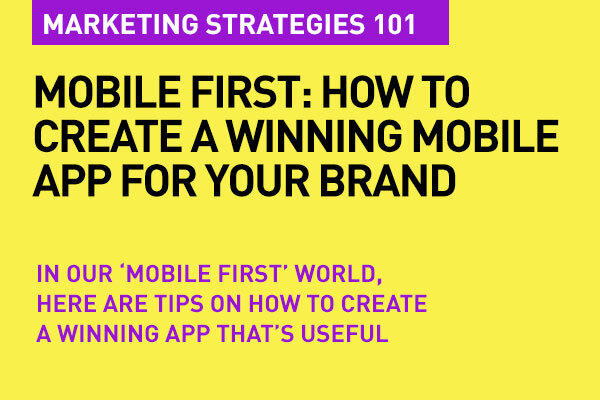 Read now on: Lean Forward : Mobile and App Marketing Strategy Essentials. So how do you create a winning app? And make it truly useful? Focus on the user. You need to build an app that the user will find necessary long term – way beyond the first week of download. In order to do this, your app needs to be easy to use, have memorable features, navigation easy, and ideally, usable without being connected for the most part. The app will need to be something that the user will think of when they need a resolution to a need – and that need revolves around a solution tat you uniquely provide via the app. Brands today keep creating new app, many of which use new technology like geolocation, virtual reality, NFC, and augmented reality. But do these add meaning and experience value, or is it just marketers showing off? Remember that 25% of app users open an app once – and never return! No matter how much tech is pumped into it. Google says it brilliantly... "More than ever, people are engaging with their phones in crucial moments and for shorter periods of time. Their experiences need to be efficient and delightful. Plus, a well-designed app that provides utility has the power to cut through the clutter. It can deliver on people's many I-want-to-know, I-want-to-go, I-want-to-buy, and I-want-to-do moments." That's the golden key. Attract and quickly engage users by addressing their tasks clearly, show them the resolution to the need right away. Place calls to action up front and center. Highlight your app’s key and new features in relevance to the need at the appropriate place in the app so they're a source of solution and continuing interest rather than and confusion leading to abandonment. Check the menu design – including how you use menu categories for the way users think – not your brand approach to product. Avoid overlapping categories and fuzzy logic. When a user looks at your "solutions" menu for the particular need to be addressed, make sure it is clearly understood. In case the user wants to go back for information they missed, make that step easy. They should not have go back to right where they started. Apps should leverage back functionality so that users don't feel forced to have to start over from the home screen, which, in some cases, results in losing any unsaved data. That interrupts the flow of both thought and process. Transition – either by the user to complete a task – or when required by the app itself, should be seamless. If the app forces that move, often it just has a negative impact. If that is important, make the process easy. Navigation, look and feel, experience – all these factors need to be absolutely consistent. And speed is important too. It shouldn't take long minutes for the web continuation to appear and unfold. Departure and arrival points need to match across both. Most apps today use geo location. That's the magic of mobile. And auto detection of location is a feature that helps with time and effort. But sometimes, an user might want to change that manually, when they need to find a store or a featured service that's not located where they are. Make manual entry of location easy and straightforward. I don't mean a Google search feature here. Users with a specific task or need will typically look for a search field. They often prefer this to browsing. Apps that do not have a prominently placed search box can sometimes result in just giving up. People are so used to search these days for solutions, it has become part of life. Make that possible within the app you create. Provide filter and sorting within results if your search indexing and results offer many solutions. Users get confused when their search terms result in too many results. Filter and sort options can help users narrow and organize their results. Product reviews within your app are hugely motivating towards the end game – the purchase. Hopefully you will have a ratings system. Enable users to sort and filter so they can find the right positive (or negative review), the latest ones, and the ones that are 'verified' as reviewed by users who actually bought the product. Registration is most often a source of user frustration and can be a hindrance to them continuing beyond the first look at your app – or to final conversion. Users abandon apps that asks them to register and provide personal information upfront unless your app provides an immediate solution that requires that information. Do not confuse the user between "sign in" from "sign up." Many users end up taking the wrong action when attempting to sign up for an account by tapping on the "sign in" button, which then prompts them for a password. Your app's "sign in" and a "sign up" buttons should be clearly distinguishable from each other so users don't get confused and frustrated. Don't frustrate and delay the user experience by making them go through a annoying multi-step process to set up or reset a password. Reduce the risk of abandonment by simplifying the password barrier experience. User experience is key. It may be a cool design, but does it speak the same language as the user. It's not about how your brand speaks, but what the user is looking for. Unknown terms or phrases will just turn them off or confuse them. In your button designs, your visual "keys" need to be as universal as possible. Let the user control the zoom. Show them exactly what they are about to purchase, or what other products match what they're looking for. Forms should be compatible with how users enter information across today's wide spectrum mobile and web app experiences. Your app should have form fields or completion buttons that are not obstructed from view by interface elements such as the keyboard or which require huge scroll actions. As the user completes form fields, automatically advance each field up the screen is a better way. Your app's keyboard should match input needed. The text keys should appear for text fields, and the numeric pad for numbers. It's all about ease of experience. Don't just give users an option to pay using their credit cards. Enable PayPal, Android or ApplePay when that's possible in your markets. Keep the experience simple with payment information storage and reducing the number of steps involved. Be sure to include the ability to add multiple cards and a function to toggle between them. That's simply some useful points to remember when you want to create a winning app experience for you user. Now that you know how to create that winning app, did you also consider a responsive – "mobile ready" website? Sometimes you need both. Sometimes, just one. Whichever solves the intent that the target audience has. Mobile Marketing: Native App or Responsive Website? Which one's right? And that's the basics of digital marketing strategies. That's 101. Very useful article. This kind of is a To Do list for companies determined to go the app route. Many companies make great looking apps with great user interfaces, but their UX - user experience is poor. Thus the app gets uninstalled. 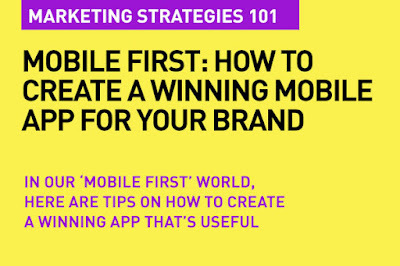 Fantastic list for those who want to create an App as a marketing tool. Every point here is a valuable reminder on what to focus on.